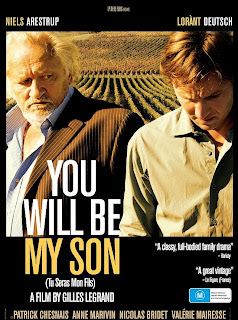 There is no shortage of films in which sons try desperately to win the approval of cold, dismissive fathers, so YOU WILL BE MY SON deserves at least some credit for finding a fresh take on the tried and true premise. A few clever turns of plot aside, though, the film is primarily a character study of characters who aren't nearly interesting enough to warrant such scrutiny. 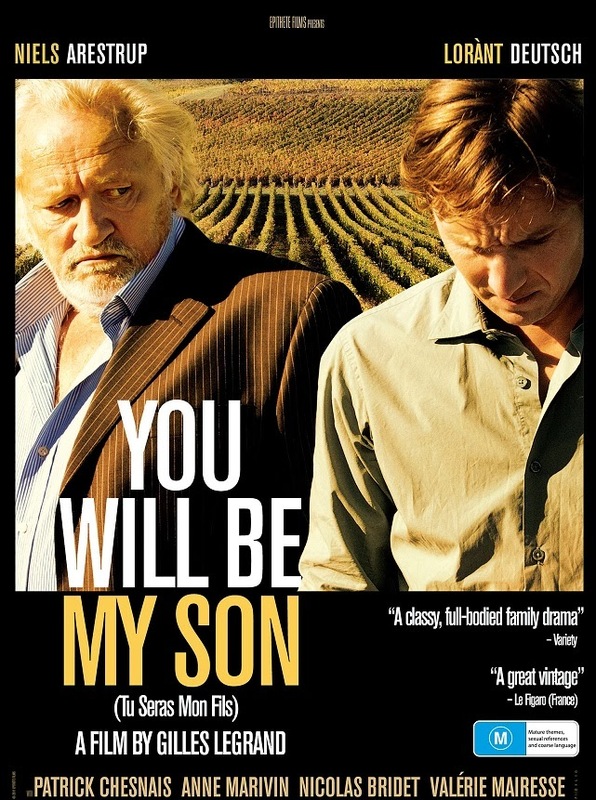 It takes only minutes to establish that renowned winemaker Paul de Marseul (Niels Arestrup), the father in this father and son tale, is a horrible father and pretty distasteful human being in general. The movie then spends much of the remainder of its hour and 48 minute running time driving that point home. Paul has little use for his son Martin (Lorànt Deutsch) whom he believes can't be trusted with any real responsibility in the family business. Martin's wife Alice (Anne Marivin) tries to get her husband to stand up to the old man, but to no avail. It would seem that the audience is supposed to empathize with Martin, but that's hard to do when his only defining characteristic is a lack of backbone. The rocky relationship between Paul and Martin worsens when Paul's steward Francois (Patrick Chesnais) is diagnosed with terminal cancer and given only a few months to live, meaning he won't be able to oversee the coming harvest. Martin tries to curry paternal favor by stepping forward to take over for the ailing Francois, only to be painfully humiliated yet again when, despite his best efforts, Paul replaces him with Francois' son Phillipe (Nicolas Bridet). Not only does Phillipe take Martin's job, he essentially takes Martin's place as Paul's son. For a film that spends so much time just living with its characters, we learn surprisingly little about who they are and what motivates them. Eventually the movie reaches a point where even director Gilles Legrand and his co-writer Delphine de Vigan must have gotten bored, at which point they decide to throw a curve ball into crime film territory. It's surprising, to be sure, but the payoff is disappointing. Situations have undoubtedly changed for the characters by the time credits roll, but one gets the impression the characters themselves are still pretty much the same as when we first met them. 2 out of 4 stars.